PGDG announced the General Availability of PostgreSQL 9.6 on the 29th of September. Like each year, this new release brings with it a lot of exciting new features. Using these features, of course, requires installing PostgreSQL … a task that can be a touch daunting for novice users. 2UDA, a graphical installer for PostgreSQL, is designed to make the installation as easy as 1-2-3. Admittedly, the primary purpose of 2UDA is to provide a unified package for data analytics using PostgreSQL. 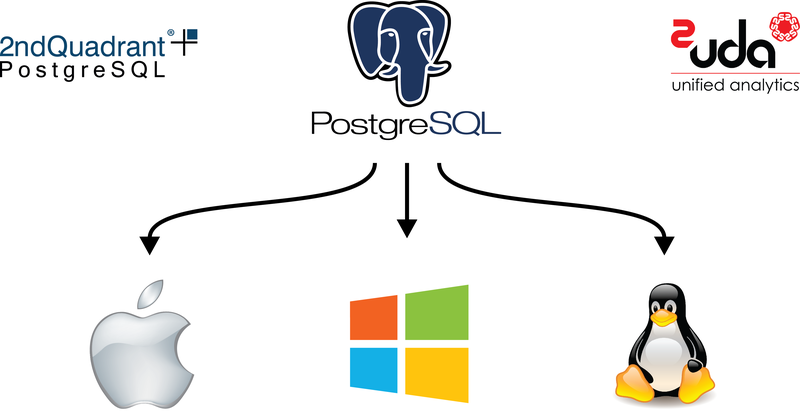 But it can just as easily be used to install PostgreSQL on the most popular platforms – Windows, OSX, & Linux. This is especially helpful for Windows & OSX, where users are more accustomed to graphical point-and-click installers. PostgreSQL 9.6 is now available in 2UDA installers and you can download your copy by visiting the homepage here. It is free to download and use … you don’t even have to register yourself! 2ndQuadrant is fully committed to releasing 2UDA updates the same day PGDG announces PostrgeSQL updates. So you can be sure you will not be left hanging for critical security updates and hotfixes.